PSJ’s mission is to contribute to the protection of sharks, our oceans and marine life by undertaking actions that encourage environmental activism and sustainable consumption choices. Our vision is of a future where our oceans are alive and the creatures living in the m thrive. PSJ is a Japan-based non-governmental and not-for-profit organisation working together with creative individuals and groups towards a common goal of positive education about sharks and marine life. Through artivism, events, educational talks and campaigns we work to create a change within the community and develop an understanding of the need to preserve and protect the world’s oceans. Apply for a paid fellowship at a US non-profit organization—Atlas Corps seeks Japanese non-profit leaders to apply to the year-long Atlas Corps TOMODACHI Fellows Program in the US. Google launches “Innovation Tohoku,”— The website (available only in Japanese) links individual and corporate supporters in Japan with Tohoku businesses to encourage collaboration between the two groups and propel economic recovery efforts in the region. Reconstruction Agency announces a 260 million yen (approximately $2.6 million) Tohoku recovery initiative focusing on NPOs— The document (available only in Japanese) outlines the agency’s plans to strengthen the operational capacity of the NPOs based in the region. A report released by the agency with a list of government-funded recovery programs is also available in Japanese. O.G.A. 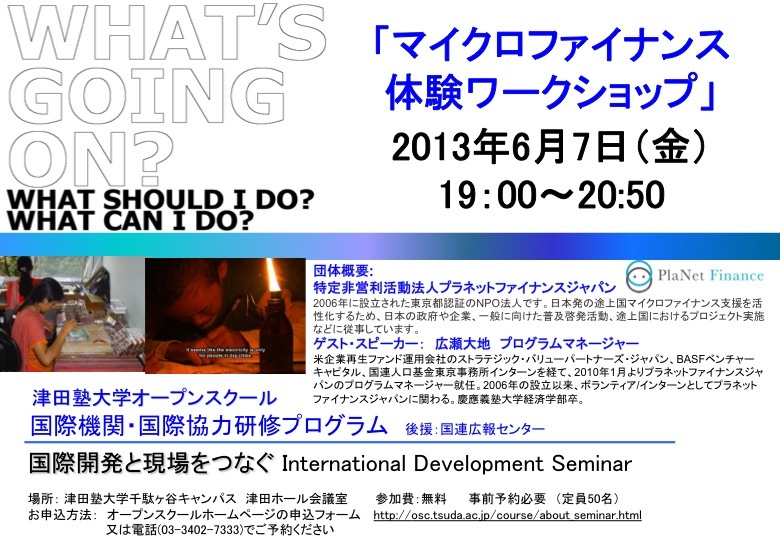 FOR AID is organizing a huge gathering of support in Yoyogi July 21st from 15-18:00. NHK producer will be there filming and we will use that footage to create a fundraising campaign for online platforms such as indie gogo. some sponsors saying they will match what we can raise and also we will be selling tshirts, & sunglasses. The second thing is that a company called Warrior Dash http://warriordash.jp has agreed to support financially for each runner we recruit for their next event in July. We will also be petitioning our friends, corporations etc to sponsor runners (50,000jpy a runner, can be split between sponsors, friends etc) Warrior Dash is allowing 100% to go to the cause and we are working now to see about other companies matching the donation should these runners succeed :) give it a little competitive edge and make it fun! Give2Asia recently partnered with YouChange, a local Chinese organization to build eco-friendly and weather-resistant temporary shelters for victims of the April 20 earthquake in Sichuan Province, China. The shelters are made out of local bamboo and corrugated steel roofing. A total of 830 shelters will protect disaster-affected communities in the hardest hit areas of Sichuan Province. YouChange developed the lightweight and easy to construct shelters following a 5.5-magnitude earthquake in Yunan Province in 2011. The shelters in Yunan survived aftershocks and monsoons, and continue to protect many affected families today. Read more about Give2Asia's Sichuan Earthquake Response here. PEPY Child Clubs (also known as Child-to-Child) and Young Leader clubs are ending this year. Many staff and volunteers have been involved in the clubs and have watched young people grow to become leaders in their communities. There are many happy memories! However, we are excited to see the young people take on bigger leadership roles and are happy to be working with them in new ways in the future. We have explained our reason for this decision, and the transition process happening now in this blog article. We’d be happy to have your feedback, comments, or memories you may have to share about this project. Please look at this slideshow to see recent activities at the Kok Thnot village Child Club session. A major revision to the Law is a five-year rule for workers employed under a fixed-term labor contract. This rule will require employers to then convert such contracts to no-term ones, as is the practice among regular company employees.The official interpretation of this is that the amendment will lead to greater job security for workers. This has created a lot of ambiguous interpretations on behalf of several institutions and organisations; as well as, to the people it will effect ( contract workers). To give employees a better understanding of what this all means, Tozen Union ( Zenkoku Ippan Tokyo General Union ) will holding a 3hr seminar on this new amendment. The main presenters will be :Tozen's Attorney ,Shoichi Ibusuki:Executive President/Advocate, Hifumi Okunuki:General Secretary,Louis Carlet. Japanese NGOs in Tohoku - July 4th! ［ファンドレイジング・日本 2014] be a speaker - great experience!!! 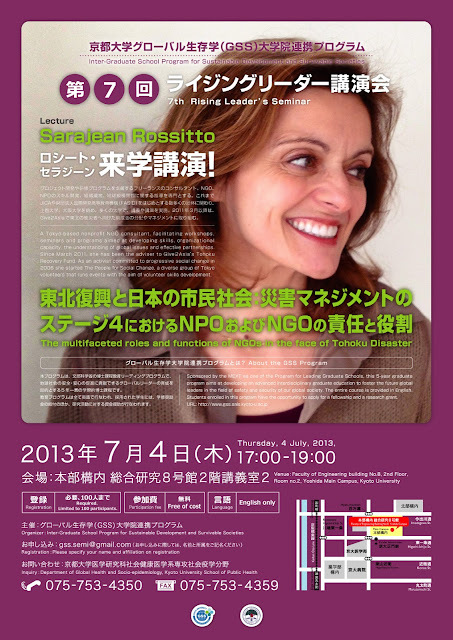 Rising leader seminar in Kyoto - July 4th! *Thursday, June 20th is a preview performance and admission is just 1,000 yen for the first 30 people (in line) and just 2,000 yen for all other patrons. Advance reservations for this performance will not be available. At the Door: 3,500 yen **All patrons will receive one free drink from the bar as part of the entrance fee. 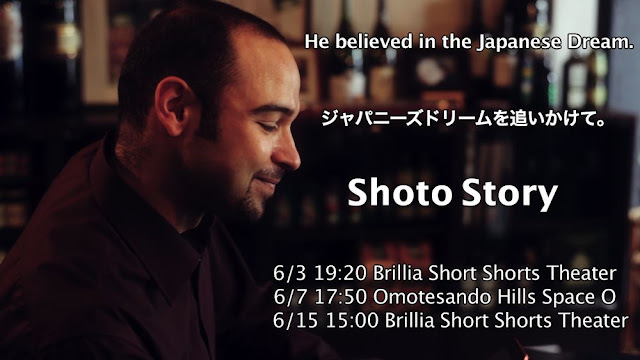 "Shoto Story" by Cyrus Sethnahas been selected by Short Shorts Film Festival and Asia, the largest short film festival in Asia. Save the date Friday, October 4th for RFTC Casino Night!